I’m very partial to my Christmas decorations this year! They are simple were so doable. Especially the decor on my open shelves. I didn’t really have to rearrange much! I mostly added some pretty Christmas decorations and a few brightly wrapped presents. Don’t you love decorating the easy way… especially when the finished product reflects your style? 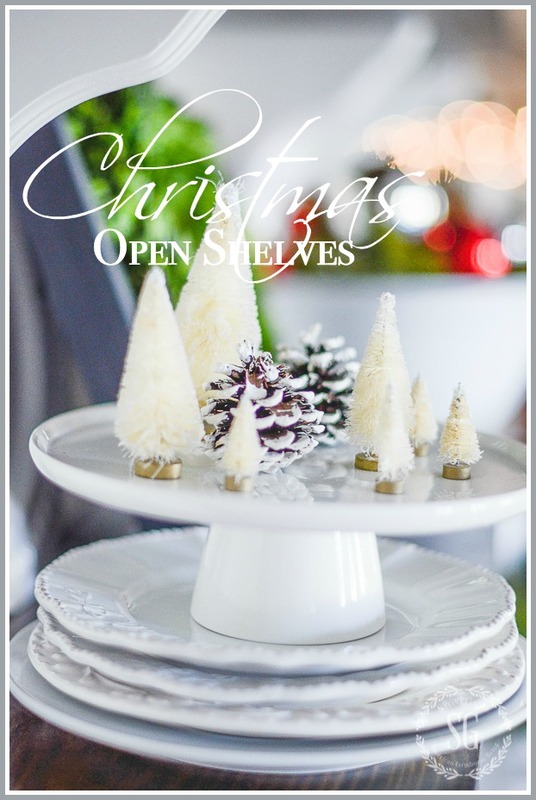 And the Christmas open shelves are just my style! The back of StoneGable is very open and I call it the “back bowling alley”. It’s long and narrow. It starts at the garage door and ends at the fireplace. My breakfast nook is tucked right in the middle of the bowling alley! To the left are the open shelves and bar and to the right is my kitchen table. Just an FYI… this area is getting a little makeover and I’ll share it with you on January 11th. My husband, Bobby planked the wall and made the shelves above the bar. This has become such a fun spot to decorate! Most of the year I keep the open shelves pretty neutral… white mostly because I don’t want them to look too busy. But who could resist adding a little Christmas color? The boxwood in the frame made an appearance again this year. It brings a big pop of pretty green color! Boxwood is perfect for this time of year! I wrapped a few small packages in some non-traditional Christmas wrapping paper and added them to the shelf too! I love wrapping Christmas gifts with fun paper and bows! Boxwood is a repeated theme on the shelves this season! Here’s a design tip: repeat themes and colors and elements throughout shelves like the ones here or bookcases or hutches. It will make the area you are decorating look put together! I added a new white pitcher on the top shelf. It has a chalkboard band around it. I wrote “joy” on it and embellished it with my signature black and white ribbon to reflect the season! I’m sure it will be a fixture on the shelves! This year’s Christmas theme is “trees”! Bottle brushes dot the shelves! Each year I pick a “theme” for Christmas. It helps me choose my decorations, gift wrap, ribbon, etc. I think next year’s theme is going to be WINTER WONDERLAND. Sorta soft and white and snowy. But next Christmas is a long way off so the theme is not written in stone! All the little white bottle brushes I’ve been collection would work perfectly with a Winter Wonderland theme, don’t you think? What Christmas decor in your home is your favorite this year? Please share! You might like to follow me on Pinterest and see all the things I am finding to pin every day HERE. I love all of the white and green! and those presents are just the perfect added touch. 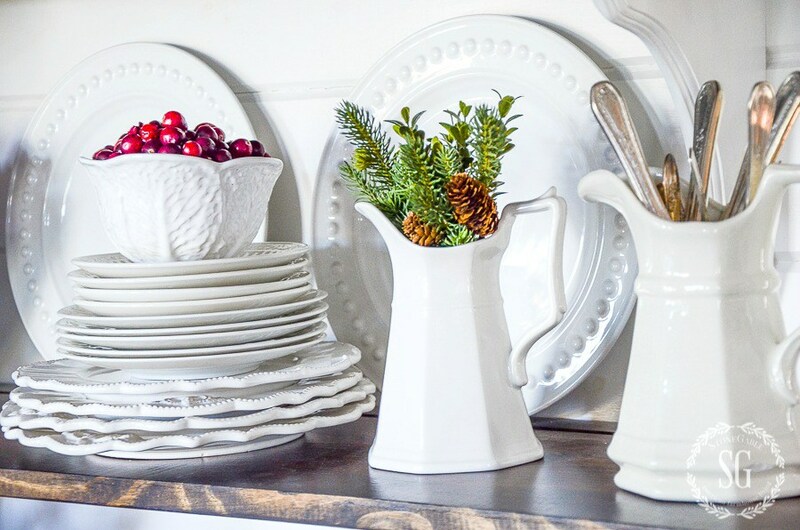 Yvonne – you have inspired me to begin collecting white pitchers and whenever I can find white pottery, stoneware, or porcelain ones at flea markets, yard sales, and the Goodwill, I purchase them. I also collect antique platters and the plain white ones, I combine with the pitchers. I also love your mercury glass and have found it’s costly. I’m going to try to replicate the silver glass with some of the recipes I’ve seen on the Internet. I love the chunky candlesticks! Thank you for the inspiration! Yes!! I do love your decor. 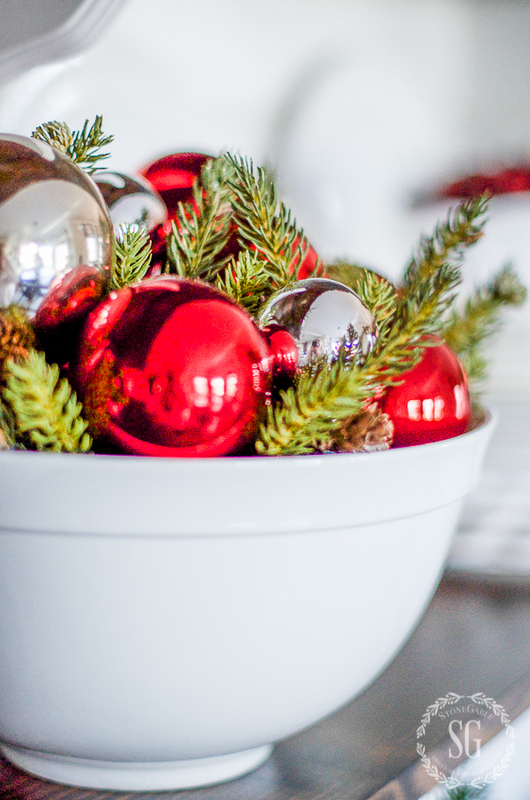 The red balls with the greenery tucked in in that bowl was so striking. Cranberries piled in a bowl. Joy on paper(?) added to the front of a pitcher!!! I’ve gotten sick and so plans are cancelled for my two companies that were special but I realize that as a housebound person, I decorate for me. I delight in the look of items displayed. That’s why I like to look at your blog. You photograph it all so well I can enjoy your decor too!!!! Merry Christmas. I’ve been meditating on JOY. despite grief, and other sorrows I held my second grandchild last week. A boy! And again, as when I held my newborn girls, the coming of Gods Son as a baby for me becomes more real. I’ve been listening to a MercyMe Christmas song Lullaby that fills my eyes with tears of love for my Lotd. And thankful heart for my miracle grandson. I really am feeling worse. Pray for me to heal. Your home is so warm and inviting! Love to have tea there! Enjoys your grand baby’s first Christmas! I will be! Lovely, as always! 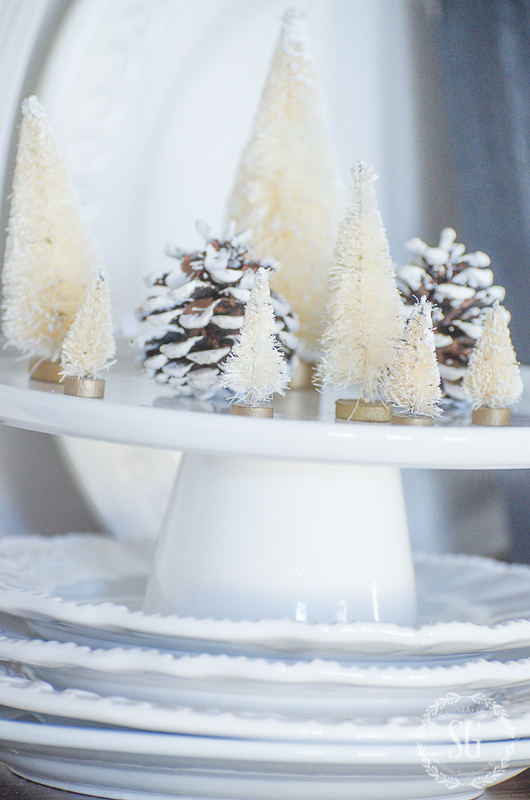 I particularly like the white trees and pine cones on the cake plate. Your shelves are so pretty and your new pitcher is cute! I can’t wait to see the updates you have coming in January. I love your open shelves! I used yours as a sample for mine this season. Next year, I want to add more, but this year was really fun. 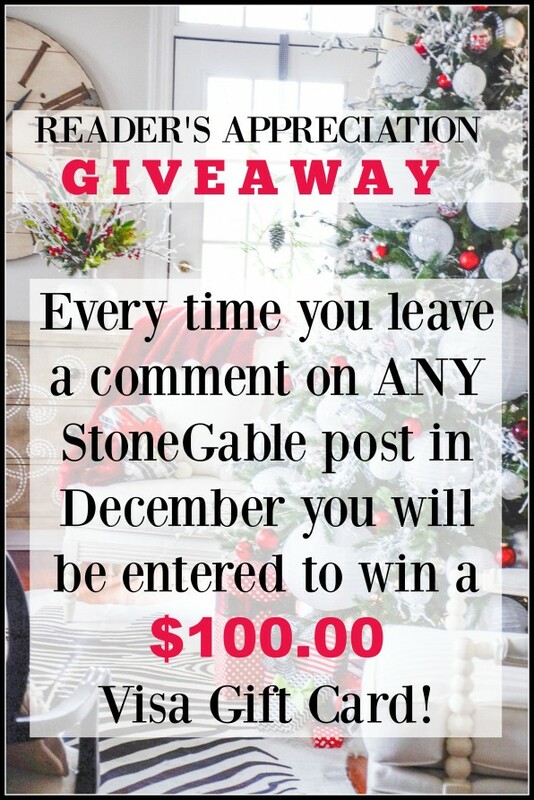 I posted mine on FB and received more comments on that post than any I have ever received! Fun! 🙂 Thanks for all your help! Love the wall and shelves! And your Christmas decorating is beautiful! Thank you for all the great decorating ideas this year. Merry Christmas and Happy New Year! Beautifully done! 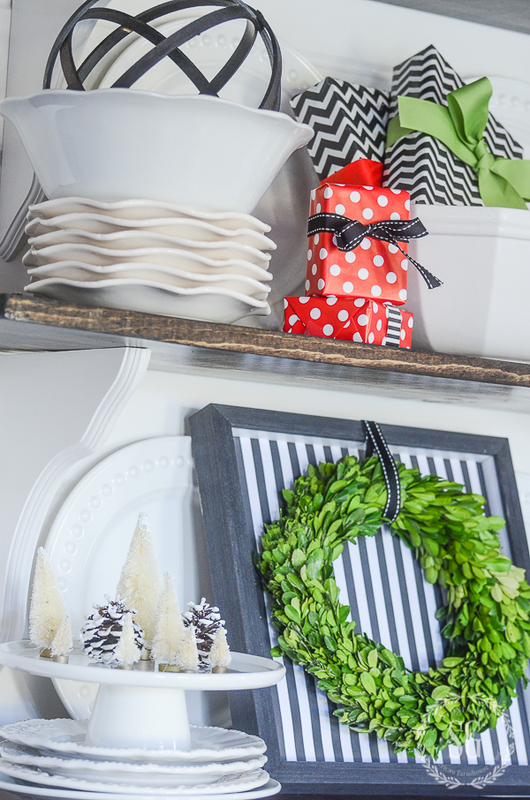 We just finished installing open shelving in our kitchen and I can’t wait to decorate it! Thank you for the inspiration and Mery Christmas! Christmas. It will be extra special this year because of that new grandson. I have said for years that being a grandparent is one of the few things in life that lives up to it’s billing. I do love your open shelves. How do you keep from dusting every day?! My house is small and open shelving just might be what i need. white.our house always looks lovely. Followed your advice for my kitchen shelves. Added small green trees with teeny white stars and snowflakes to existing blue/white and cream bowls, pitchers, teapots. Also embellished with mixed real and faux greens, put creamy solid candy canes in apothecary jar. Hope you are on the mend and taking it easy. Simple, Beautiful. Elegant. Love everything you blog about. Have a Merry Christmas and a Happy New Year! Love all your Christmas decor. Merry Christmas ! Very pretty and simple. 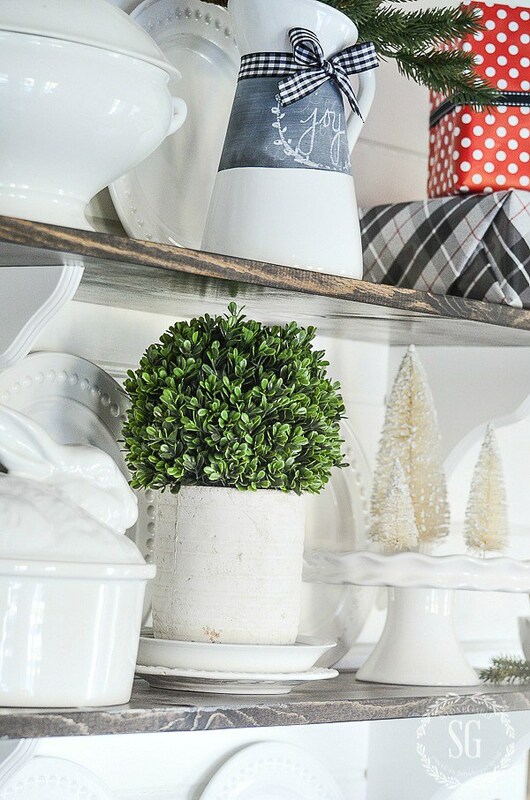 Boxwood is a go to at Christmas in my house too! As always, love your decorating style. I have so loved my Willow Tree Nativity this year. It has been especially meaningful to both my husband and me. Everything looks beautiful, simple elegance! And you can’t go wrong with black and white. This year since we purchased a new “skinny” tree, I also did new decorations in a Woodland theme. My tree has 2 sprays of frosted pine branches tucked in, and one of them is accented with an adorable felt stuffed squirrel! He has just the right attitude with his red flannel scarf to cozy up the tree for our country french farmhouse look. White snowball ornaments and red berries look so pretty with it. Whites and brown carry over into our other decor. Thanks, Yvonne, for all your efforts to bring a classic touch of Christmas to all of us. Take it easy now and enjoy the holiday, lol. Lovely and elegant. Wishing you and yours a Merry Christmas and a blessed 2017. Beautiful. Thanks for the decorating ideas!!! Yvonne, I hope you are doing well. It must be hard to not be able to do all the things you do at Christmas. Can you tell me where you buy your Sgnature black and white checked ribbon, please! Thanks and your blog is on my list as my #1 blog!! Beautiful as always! Glad you are up and around and feeling better! So festive! I’m thinking where I can add some open shelving now…maybe in my formal dining room. Hmmmm….2017? Merry Christmas to you and your family. Nurse that ankle. Everytime I look at this, i see something else to copy, ha. Beautiful! Perfect Coloring. Crisp, clean and classy! My fave decoration this year is placing greenery among the white and lime greens that dominate my family room decor. I am blessed to have black and white dishes so your photos using yours have been so helpful! As always, Beautiful! I love the new pitcher. Hope you are healing well and Merry Christmas and Happy New Year. 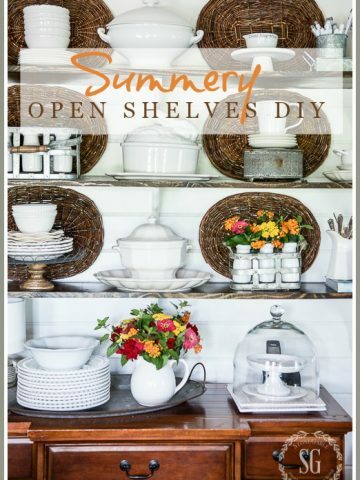 I love EVERYTHING from the open shelving to all the greenery! Great job and thanks for sharing! We just moved into a new-to-us home and I no longer have a built-in hutch. I just mentioned to my family that I should put open shelves in the dining room to store all the dishes. Perfect timing and great inspiration! It’s all beautiful. I’m looking forward to seeing the changes you are planning for your dining room in January. Merry Christmas! 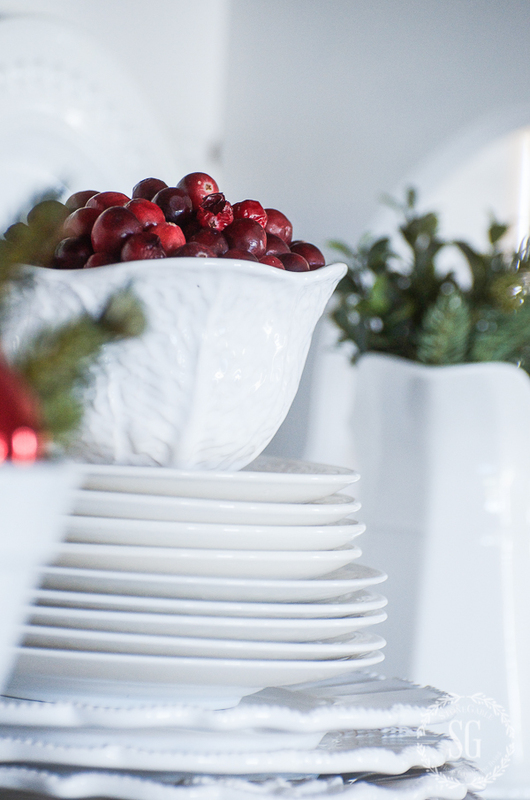 My favorite things are the bowls with greenery and shiny ornaments! Once again you did a beautiful job! thank you! I want to put up some open shelves just so I can decorate them like you did! shopping for foyer rugs thanks for all your earlier tips! 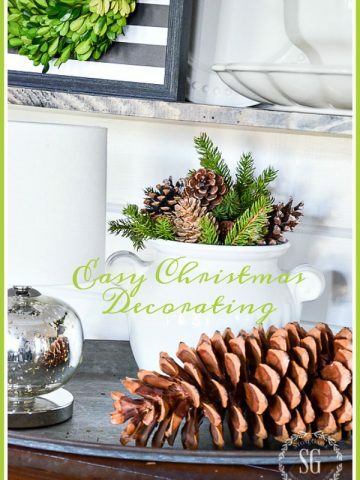 Question…How do your feel about leaving bits of pine, red, and snowmen up into the New Year?? What an amazing sense of style you always offer us. I am inspired by you!! Merry Christmas to you and yours!! Love it!!! Always such beautiful decorating! Where did you find that awesome pitcher with the chalkboard band?? 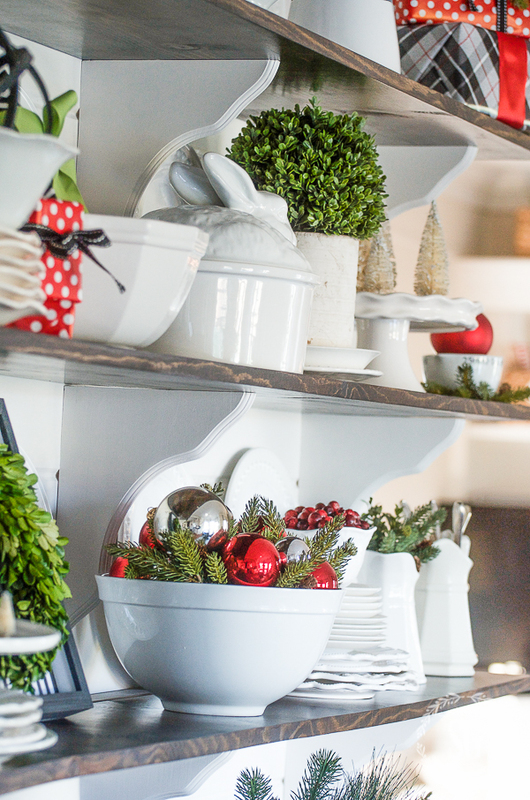 I love your shelves and you added just the right touch of Christmas to make them look festive without being too “busy”! I haven’t installed my kitchen shelving yet but you are my inspiration on how I want to style them once they are up. 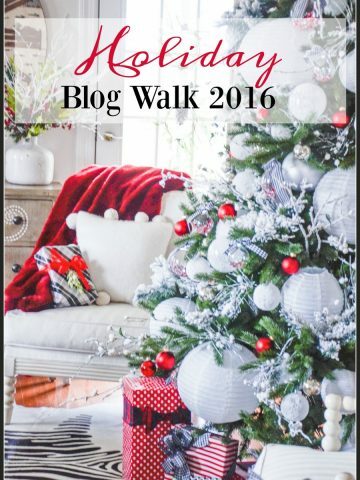 I’ve seen so much neutral decor in blogs this year. I find it a little lacking of personality . Your home is gorgeous and unique-i’m so happy you went with the touches of red. Everything is beautiful and festive-thank you for sharing your world with us! Those little box woods really add a winter touch and it’s so easy. We all like easy this time of the year. I am excited to see what changes you have in store for the new year. Merry Christmas! My husband passed away in June. Christmas eve would have been our 40th wedding anniversary. This is a sad Christmas for me, but your blog and beautiful ideas seem to lift my spirits. Thank you. Merry Christmas and may God bless you and yours. We weathered a wind storm last night so I’ll be adding my fresh greens this afternoon. Looks beautiful., as usual! Love the greenery and have started to collect as well! I too love starting my morning with you! I love all your Christmas decorations and have incorporated several of them in my own celebration of the season. Yvonne, I always look forward to your posts. However, I can’t wait to see your Christmas decor revealed!! Simply stunning. You have such an eye for detail my friend. Your home is so warm and inviting, yet done simply. I adore that your new pitcher too! Would you mind sharing where your purchased it from? Praying for continued healing for you this season. i think my favorite is the green on the chandelier. As always, your decor is elegant, yet simply so. I’m following your example this year in mixing fresh greens with realistic faux greens. Hope you are taking good care of yourself. Merry Christmas to you and yours! 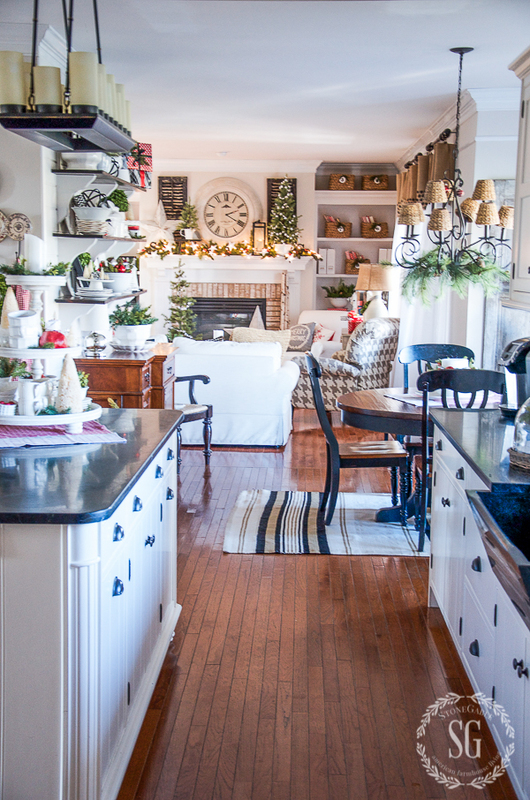 I love your feasted Christmas kitchen. Happy holiday! I love your description of your kitchen–a bowling alley. All the natural greenery adds that special Christmas touch and feel and aroma. Your home has a comfortable and welcoming vibe, especially at the holidays! Beautiful shelves! Hope you are mending!!!!!! Your displays look great. I like the assortment of textures and colors. I just love the boxwood wreath in the frame! Everything looks lovely! Your open shelves look lovely! Whenever I look at your beautiful house and gorgeous rooms, I get that warm and cozy feeling, all over. You are so real and so talented. You inspire me to decorate!!! I collect milk glass, and your decorations have given me joy! Thanks again, and Merry Christmas! Hands down my favorite decor for this year is anything with the popular red vehicle (pickup, car) with a Christmas Tree on the roof. I just love them! I really appreciate the attention to detail and the fantastic photography. Can you please post a photo of that space dead-on? I would like to see the shelves in relation to the bar piece – full frontal photo. I have some open shelving, but mine looks cluttery when I add the embellishments. Seeing yours in full view will help me figure out what I can do better. I have white dishes and some vintage green jadeite. I too would like to find the Joy pitcher! It would be so versatile all year long. Love everything as always!! Yes, yes, yes! That’s why I blog! You have inspired me to start collecting white kitchen-ware. Your pieces are so versatile and with small changes (ribbon, greenery), they can take on a whole new look! Thank you for the wonderful ideas! I love the way you decorated your shelves. The white dishes with green, red and black accents are perfect. I always look forward to seeing what you do next. Thanks for sharing your wonderfully decorated home. May you be blessed this Christmas and New York. Very pretty! Hope you are feeling better! Thx for sharing! I love the pops of red and green that you’ve added. It stays true to traditional Christmas without overpowering your neutral palette. I love to see all your ideas each morning. Thank you for your inspiration. May you be able to enjoy this season and heal well. Hello Yvonne, I love your home. So lovely, it is calming to me. I don’t have a theme this year but I am already thinking of one next year, a lot of inspiration here. Thanks, hope you get well soon. Happy holidays to you! Every year, my tree is my favorite of my Christmas decor! Wondering where you are finding the white bottle brush trees? I found some at Michael’s last year. Your home is so beautiful and inviting. I love your shelves! And the Christmas decorations look great on them! Your decorating is beautiful , everything works so well together. I especially love how the red adds that pop of colour with the black and white theme. P.S : I wish you a speedy recovery Yvonne. Hope your ankle is healing well ! Everything looks so homey and cozy. A wonderful winter retreat. Have a very blessed day! Love your shelves! Also love that your wrapping paper and ribbon choices are the same as mine! Good idea to put wrapped gifts on the open shelving. Thanks for sharing your ideas the whole year through. Thoughts for a speedy recovery and a happy holiday season. You are so talented and make everything look so easy. Everything is beautiful and festive. Thanks for the inspiration. Merry Christmas to you and your family. Prayers for a quick recovery. WHERE, OH, where do we find this pitcher with the chalkboard band??????????? Please share. I don’t just need this, I want this! I likewise love the bottle brush trees. So many sizes and colors. Your shelving is most colorful and festive ??? Your shelves look so pretty. I have lots of shelves in our new home (not open) and am getting lots of inspiration from you. Thanks for sharing your style! This year, I went a little more rustic on my “new” reclaimed wood Harvest table, I gather pine cones, washed them and dried in the oven and then painted them with copper paint, hand painted so the natural color still appears…I used copper as my pot rack overhead has my beloved collection of copper pans. Love the easy decorating style just add a little color and you’re done. And the take down after the season is over is great. Love the ideas. I love it all! So simple yet beautiful. I love the chalkboard band around the white pitcher, with the gingham bow. How CUTE is that? My theme every year is Snowmen. I decorate with them and keep them up till the end of February.Of course all the Christmas theme decorations are put away..but the snowmen stay..? I put them in different spots every year. My favorite was the white pitcher with the chalkboard band around it with “Joy” written on it. Classic look and can work all year. Oh, and your signature black/white checked ribbon was the right touch! Thanks for sharing! Great ideas to keep in mind for next year. Merry Christmas! 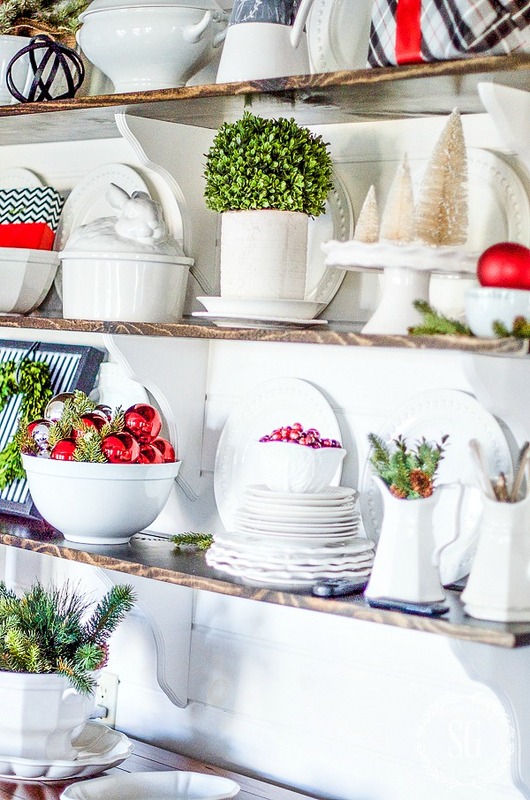 Love your shelves and you decorations! I love your easy decorating style. This year I’m following your advice and I’m collecting greenery to easily make our house Christmasy next year. Hope you’re taking it easy. Everything is very pretty. I got some ideas, as usual. Thanks. My Christmas theme is silver and gold with a little green thrown in. My tree is full of snow flakes and icicles with some silver and gold balls died. I have a white Santa Claus, stargazer lights and lots of paper whites on my dinning buffet. Lots of real greens and pine cones are scattered around the house. I’m loving the soft and natural decorations this year. 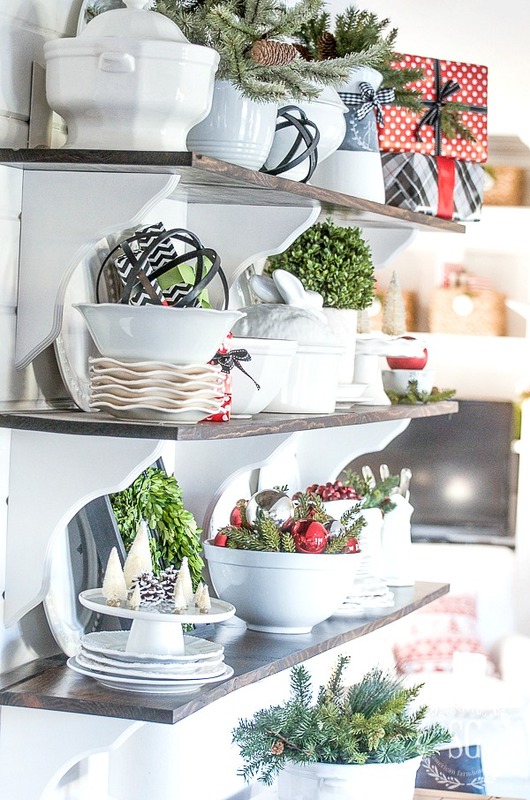 Beautiful shelves – you are so very talented. Absolutely beautiful! So simple but such an impact! I love the open shelves and the greenery you have in the dishes. Now could I borrow you to come dust? Ha. Love it. Merry Christmas. Love the white with the greenery! I love the fresh greens you tuck in such a fresh touch. Very nice. Have a Merry Christmas and blessed New Year. I love your open shelving. I always think it must be more to dust and clean but with your pretty white dishes it is beautiful. I really enjoyed perusing each shelf. I am in the process of renovating my kitchen and plan to add open shelving. 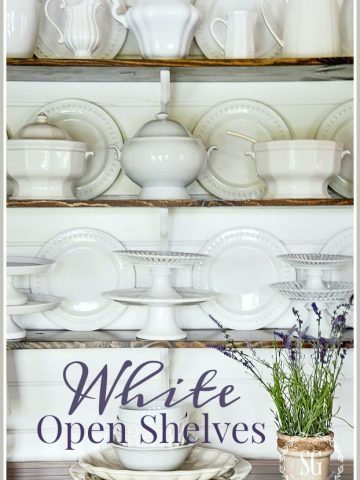 You just gave me the idea to display all white dishes with some pop of color. Yours are absolutely stunning! I also hope you are recuperating nicely. Have a very Merry Christmas and best wishes for 2017.